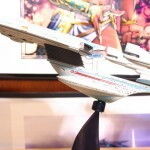 Forum member User897 has pointed us to news that some of the Diamond Select Toys new Star Trek U.S.S. Enterprise-B Electronic Vehicles have the words U.S.S. Excelsior printed on the sides. A couple of posts on their Facebook Page confirms that a few people have noticed this error as well. Production error. If you ever buy your own, you can get decals from customer service. Tyjos has already requested his. Click the thumbnail to check out a pic showing the naming error. Discuss on the Toyark Forums› Views: 4502 › Credit: User897 of the Toyark Forums! I don't think this is in error, but perhaps a variant or something. If memory serves, after the Enterprise is destroyed in Wrath, their next ship was originally the Excelsior or another constitution class. I know the Excelsior model was used to construct the Enterprise-B, but don't recall the Enterprise itself saying Excelsior on it. Someone pointed it out to me here. And with seeing a few different complaints on their Facebook page, figured it was worth bringing up. Hopefully this "error" means that we may eventually get an Excelsior variant. The issue with that being that the the Excelsior is designed a bit differently. The Enterprise B is actually an Excelsior-Class refit. To be a true Excelsior, the mold would be different. the excelsior is in production scheduled to be the next ship after the B it was shown with the enterprise b in its unveil a few years back along with the bird of prey. Both ships were developed at the same time and they've assured us the Excelsior has it's own mold. Let's remember, DST does NOT use stickers when the toys are made. It is all PAINT. Applying a cheap sticker to try and cover up the error is simply not good enough. When you place a sticker on a painted starship toy, the sticker sticks out like a sore thumb. This is only the latest in a series of huge mistakes DST has made with Star Trek electronic ships. If the sticker is good enough for you, hey, that's great. If it's not, then I feel they should be sent to DST in exchange for a corrected toy. This isn't a waterslide decal of windows we're talking about here. It's a sticker that will sit on top of the painted toy. I waited for THREE YEARS for this toy, and they STILL didn't get it right. I know they're "just toys", but damn! This is inexcusable. There's no feeling like knowing your toy is defective before it even arrives! I'm honestly surprised that there isn't more interest in this. This is definately one of the rare times a factory mistake will most likely be more valuable later on. And hey, it's the Excelsior. Stands up there with the Enterprise, Reliant, and Voyager as the most famous Trek ships. Especially from a company that has announced they have no real desire to release ships not named Enterprise. It's not like they gave the Enterprise the wrong letter suffix. And the Excelsior as an excelsior refit is not without precedence. 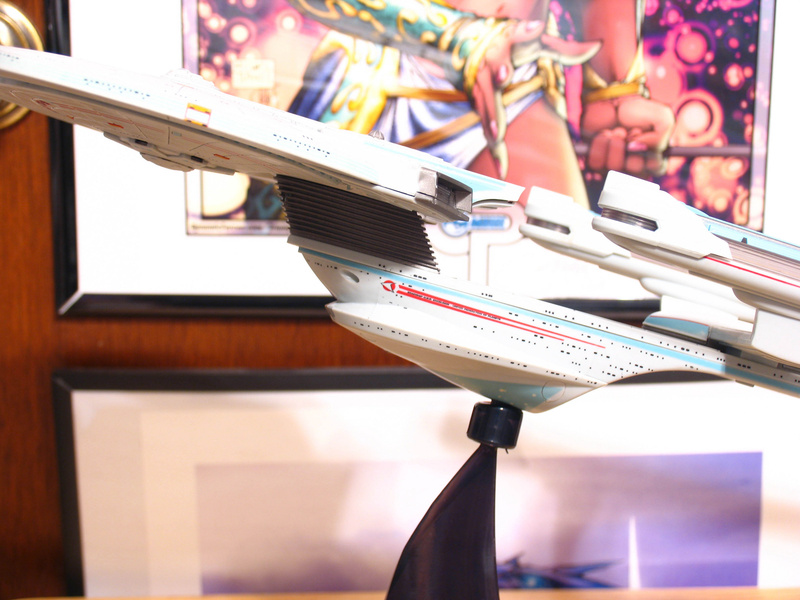 Playmates reissued their Enterprise-B as the Excelsior. I'm not saying the mistake is a good thing, but I don't see it being "defective." True, a sticker replacement is not good enough. A full exchange is the only proper course of action. But, getting a more famous ship is not the end of the world. My "All Good Things" Enterprise D had no Starfleet symbols on top of the nacelles. I'm sure they will offer stickers but I may actually prefer it this way. Just shows they are trying to build these as cheaply as possible and the factory they use maybe isn't the best. I would buy a Voyager from them, but only in scale with the D and E. They would pack in the Defiant and still sell it for less than $40 I'd imagine. This is NOT going to make the defect a "valuable" toy later on. That is absurd. It IS a defect because it is something that went wrong during production. There may be some idiots that will try to sell it on eBay as a "rare variation", but that is complete hogwash. It IS the end of the world for those of us that have been waiting literally for YEARS to get the damned thing, only to discover online before even receiving it, that they screwed up YET AGAIN! DST simply does not care, and tries to cut corners in different ways with each release, because they can't even stick with the same factories each time. Look at the re-releases of the standard and AGT Enterprise-D. They told us that they were built from the same exact components as the 2008 releases, right? Yeah, sure, but they were assembled by a different factory! The result? The audio playback is too fast, making Picard and Riker sound "chipmunked!" They couldn't even bother to make sure they sounded the same. Like the sound, DST was once again in a hurry. They take years of total inactivity, then suddenly burst into action and drive everyone nuts, only to get sub-par ships in the end. Like a band-aid over an open wound, you can't just put a sticker on the thing and call it a day. A recall is in order, but DST are simply too cheap to do it. Plus, since they are a "specialty" company (I use the term very loosely here), they would claim that their overhead just wouldn't permit them to set up an exchange program. I call bull****. Just for once, I would like to receive an electronic starship from these jackals that I can put on the shelf and admire, with nothing to piss me off. The last time that happened, was after getting the window decals placed on my 2008 standard Enterprise-D. Absolutely ridiculous. I would buy a Voyager from them, but only in scale with the D and E.
Um, you do realize a to-scale Voyager would only be a little bigger than the Johnny Lightning version, don't you? It would be impossible to make it electronic at that scale, so there's no way. Dude. Calm down and don't jump on him just because he wants them to produce an inscale Voyager. Of course I realize that. Although by "only a little bigger" I assume you mean about twice the size. Voyager is about as long as the saucer section of the Enterprise-E. That is large enough to work with. I don't care much about the lights and sounds actually as they aren't always done well (look at the E). They could make Voyager at that scale with no more than a couple of LEDs and an on/off button. Would save on costs I assume. I wasn't jumping on anyone, so piss off. There, I'll jump on you. I honestly don't think that will happen. Going by their past releases, the ship will end up being in the 16 inch range, if they even do it. I agree that it isn't likely but I wouldn't I'm just saying it would be smart on their part. A lot of people wouldn't buy a larger scale Voyager for $70 and the people that really want Voyager would buy it at any size. Making it in scale with the other modern ships would be smart and allow for a cheaper price point that would move more units. Like you said, it's not something they tend to do and maybe that is why they don't want to make Voyager. Also, it has to be considered that they would have to beat the Playmates version. As far as accuracy of the mold, lights, and sounds, DST could do it. But they would also have to make the nacelles pivot like the Playmates version and the cost of such a venture is a lot more than it was in the 1990's to early 2000's. I'd be willing to bet that the nacelles are the number one thing keeping them from diving in. I think DST would be fools not to take it on, but they are going to have to overcome their fears and get the lack of QC under control. To do that, it takes time and money. Had they made the ships in scale from the start (With the E-E being the size they produced it at), I'd have been all over every release of this line. I hadn't thought about that. It would mean more than simple wire to power the LEDs in the nacelles, like laptop monitor cables, and that would drive the price up. I know the cost of making toys has gone up a lot in the last five years. Labor, plastic, shipping, etc all have risen sharply. Yes indeed. Many US companies have actually started trying to manufacture their products here in response to all of the price hikes. Go figure, LOL. Good on them. Now, if only more companies would bring their manufacturing back home, to pump more jobs and more money back into the economy. Sure, stuff would cost more, but more people would have more jobs, and be making more money to pay for it. Agreed. My Enterprise-B will finally be here on the 13th. I hope the cover up stickers arrive around the same time. Yeah right. With all the focus on NYTF, DST probably forgot about me again. Mine arrived. I'm either going to send it back or re-sell it. Not only does the starboard side have the incorrect Excelsior name, it is BACKWARDS. Also, there is a seam separation problem where the impulse engines are located. And, DST's lame attempt to weather the ship has failed. There are clusters of black paint all over the toy, as if someone got ink all over their hands, then decided to handle the toy. I am so mad and disgusted right now. So are all of them like this or just a specific run. I was about to order it until I saw this post.